Oma, He’s Making Eyes at Me. Fukui City, Japan. 31st October 2014. Refueling in Japan is invariably a pleasant experience. As you pull onto the forecourt a uniformed man or woman will almost leap out of their cubicle and wave you to the pump, ask you what you want and how you want to pay, then refill your vehicle for you. They always carefully wiped down my tank after filling it and their patient approach meant they never spilled a drop. The price was good too, at about 93/94p per litre. This at a time when UK prices where close to £1.30. At one small forecourt I pulled onto I couldn’t quite work out where the pumps were. I was waved to a stopping point and was fascinated to see that the pump nozzles hanging down from overhead. The readout screens were up there too, suitably enlarged for visibility. A clever way to get more vehicles onto a small area. I hadn’t left Kyoto until 11am and experience had shown me that on a gloomy day I was going to need to be looking for a place to stay by about 4pm. It tended to get dark quite early. I had headed out to the west coast and was riding along it northwards. 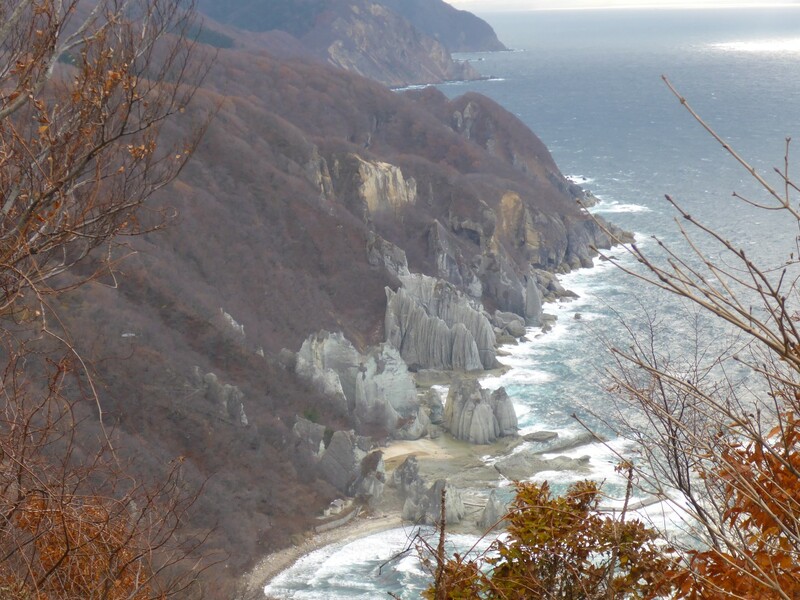 On Sae’s list of recommendations were some places in the north of Japan and I’d decided to go up there before autumn turned to winter. At one point I’d considered getting the ferry across to Hokkaido but it was quite pricey and the weather was likely to be too cold. Not exactly the Hotel California! The problem with finding a place to stay was that the coastline was rugged and the strip of land next to it narrow, so nowhere to camp. The villages and towns I passed through were small, with no evidence of accommodation that I was able to recognise. Eventually a solution appeared. I came across an abandoned restaurant snuggled in against the cliffs and I was able to tuck the bike around the side and go in through the broken side doors. Inside, the place looked as if the previous occupants had simply picked up the tills and left. Everything was still in there. Cushions, low tables, floor mats, crockery, cooking utensils. Everything that was needed to cook for and seat the guests. I almost expected the band to strike up! Actually, I didn’t because all the plumbing and most of the wiring had been ripped out. Deliberately or by thieves, it was hard to know. But I was able to make myself comfortable in the office behind the downstairs reception, using the cushions for my bed. The rain had started now so I was pleased not to be in my tent. I had expectations of a comfortable night. 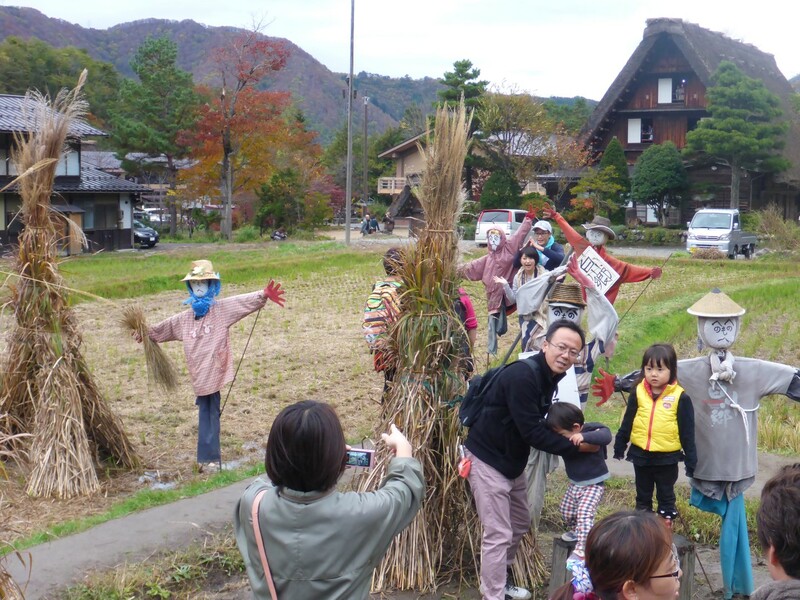 The next destination was Ogimachi Village which is the main attraction of Shirakawa-go. 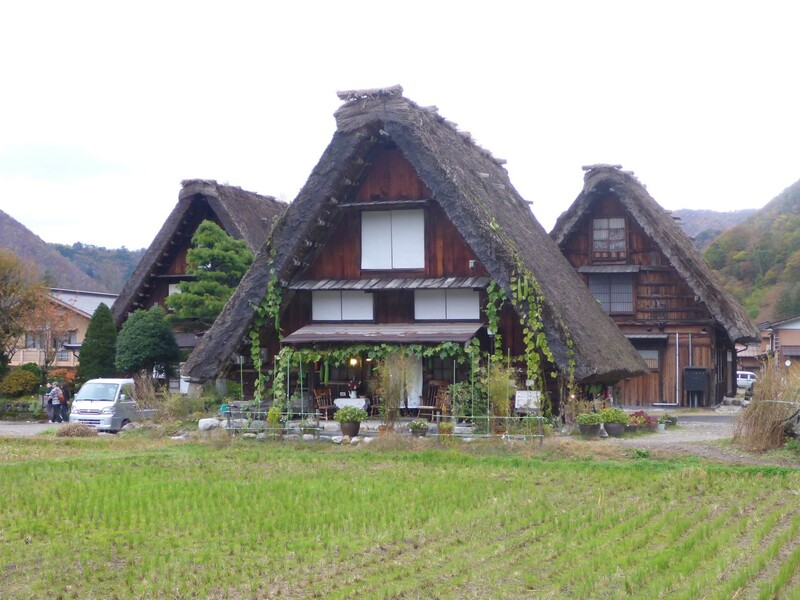 It is almost a living museum and is full of Gassho-Zukuri farmhouses, some as old as 250 years. The phrase means ‘constructed like hands in prayer’. They are designed to survive the harsh winters of the region and they are unique. The village is almost a living museum with most of the houses aimed at satisfying the tourists’ needs to stare, eat or sleep, although some are still occupied by farmers. I was fascinated by how they were constructed, especially the roofs with their 60 degree slopes. The large attic space inside was used to house silk worms. While walking among them I was amused to see a garage built in the same style. Conservation regulations? Maybe. Even the garage is in Gasoho-Zukuri style. 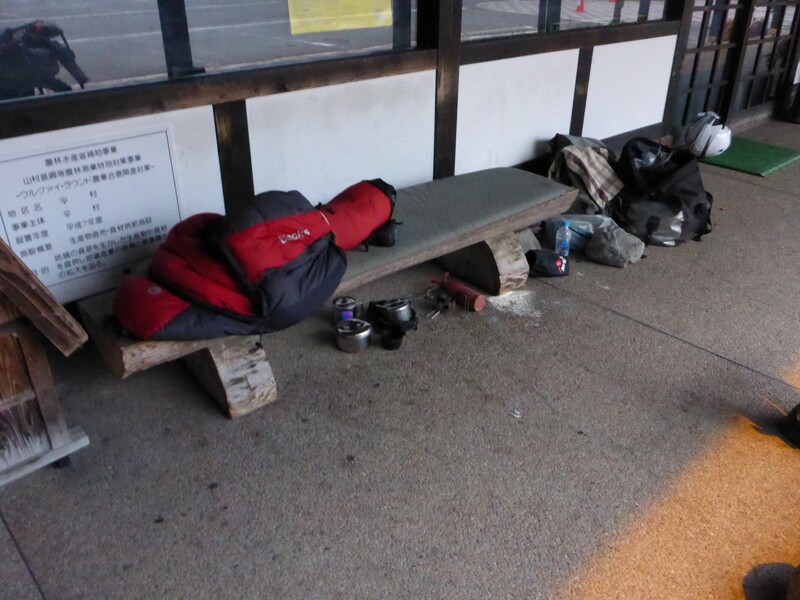 Road Stations are often found in many Japanese towns. Usually somewhere near the edge of town, these are places where motorists can refuel themselves and often their cars, enjoy some shopping, some food and generally relax while they break their journey. They were set up in the 1990’s by a national and local government partnership to improve facilities for longer distance drivers but, equally importantly, to provide retail outlets specifically to help the local economy. Some have accommodation and they also have local tourist information. The good thing about them is that you are allowed to stay overnight there, either in your car or to camp if they have a suitable patch of grass somewhere. It seems to be a cultural ‘right’ to do this although I don’t know whether this is official or not. After leaving the Ogimachi village, with no luck in finding a hotel, I found a Road Station at Taira just as it was getting dark. I asked a woman in a shop if I could camp there and she said I could or that I could sleep on one of the benches if I wanted to. In the end I did just that and found there were several people also sleeping in their cars too. I found a kind of desk with a public telephone on it which had a socket where I could plug in my laptop and I was near enough to a free wi-fi hotspot to get some internet access too. I used the heated toilet seat in the disabled loo to dry off some of my riding gear, so all in all I spent a comfortable night. One odd thing was the public tannoy, just up the road, from which a woman made several announcements at around 19.30, followed by a car driving up and down the road a couple of times tolling a bell. I really wish I knew what that was all about. The tannoy announcements came again at 6am so I took the hint and got going. I was following the coast north and eventually the rain and the slow traffic drove me onto an Expressway, just so I could cover some distance. After a couple of hours I pulled into a service area and parked next to another biker. I was pleased to find that Osuma spoke good English and was happy to chat. When I told him I was heading north he started warning me about snow! Not part of the plan at all. I was surprised because the weather was quite warm. 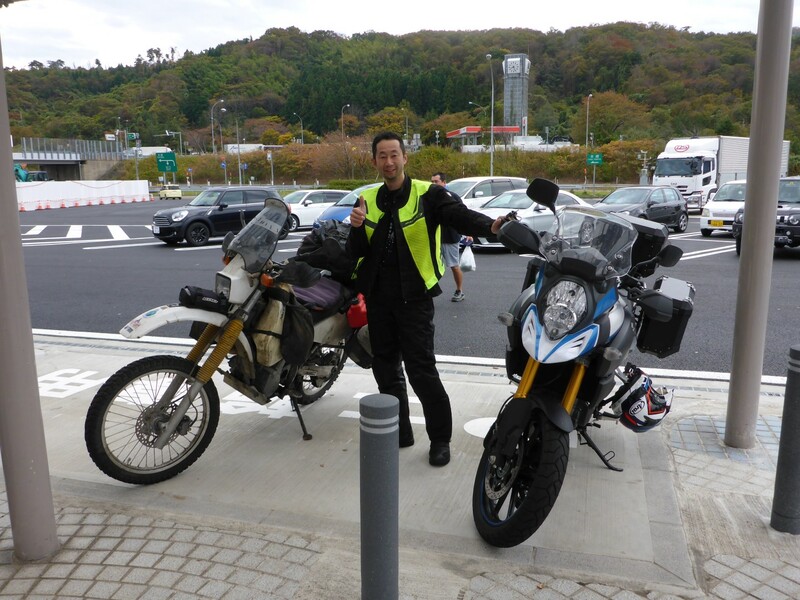 Even so, he pointed out some nice roads on the map that I could ride, one of them up around a mountain. 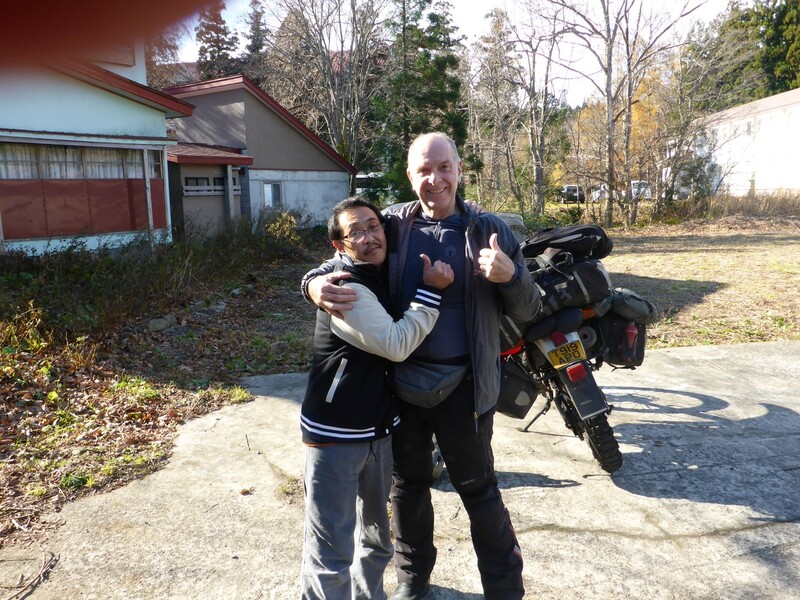 Another biker who joined us also mentioned the likely bad weather in the north. Hmmm. 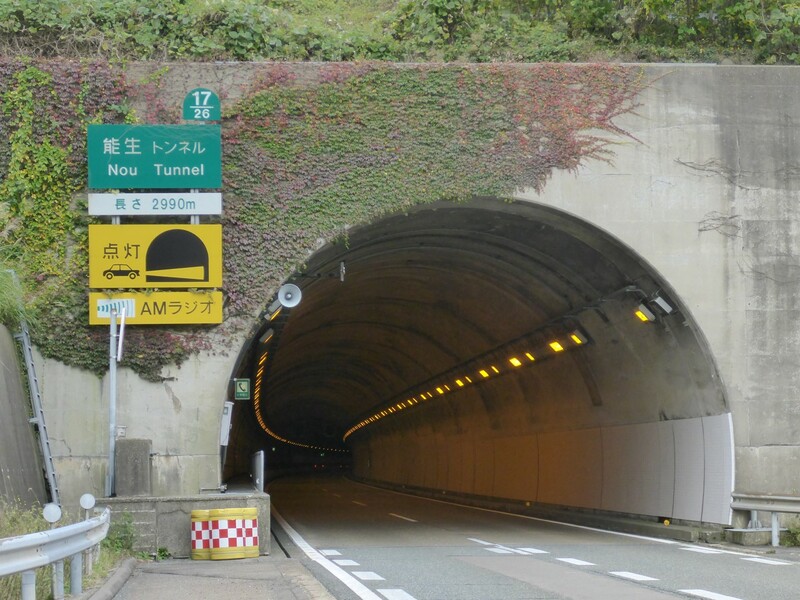 One of the brilliant tunnels that gets the road through the mountains and gives me a rest from the rain. At the end of the Expressway I nearly had a heart attack. 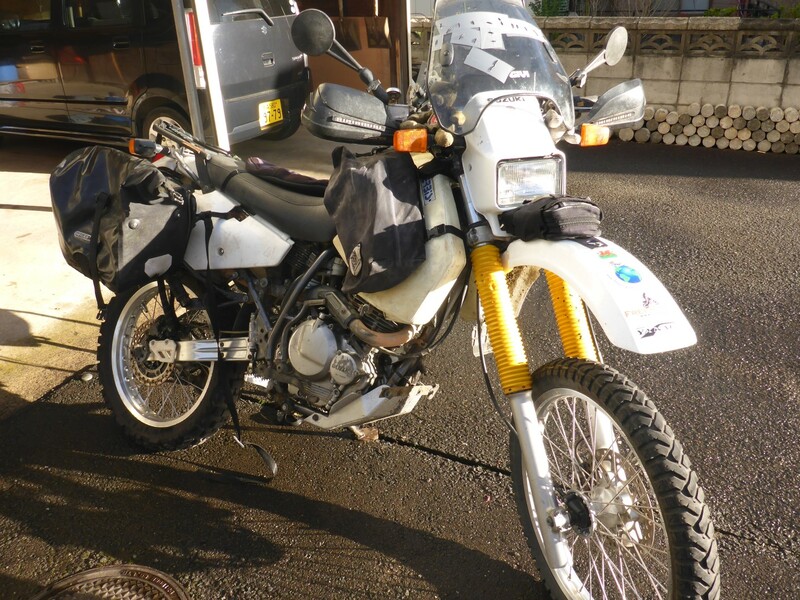 I had ridden 340kms and they relieved me of £34 for the privilege. 10p per kilometre. Unbelievable! It was still raining so eventually I found a town, found the station (always signposted) and found a hotel. Japanese rain is the wettest rain I’ve ever come across and I needed some respite. 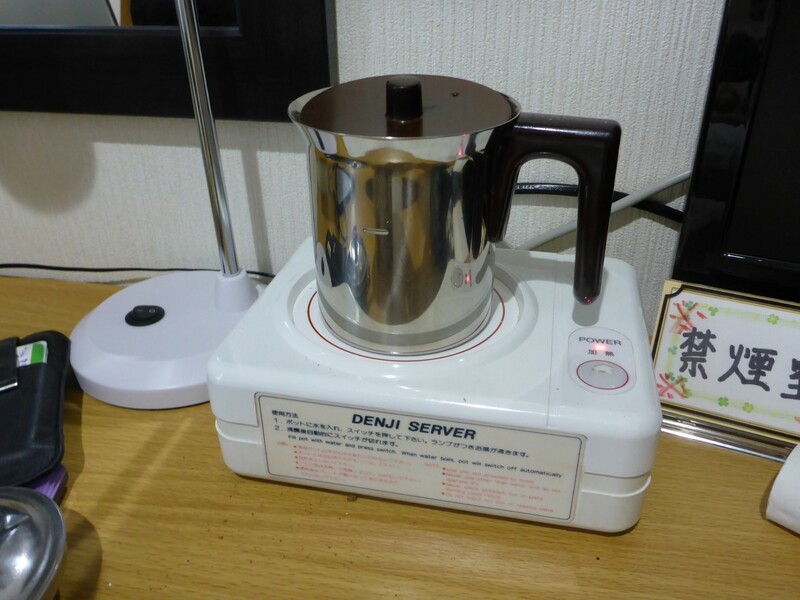 All Japanese hotels supply complimentary toiletries and they all have a small water heater for tea etc. These are great because there’s always a convenience store nearby and it’s easy to live off the sandwiches and large noodles based meals they sell. Tear off the lid and just add water. Stir in the sauce and condiments supplied, job done. You’re supposed to drain off the water before adding the sauce but I never bothered as it left a nice soup to drink. The joys of life on the road eh. A couple of days of riding got me up onto the northern peninsular where I was going to be meeting some friends of Sae’s family. 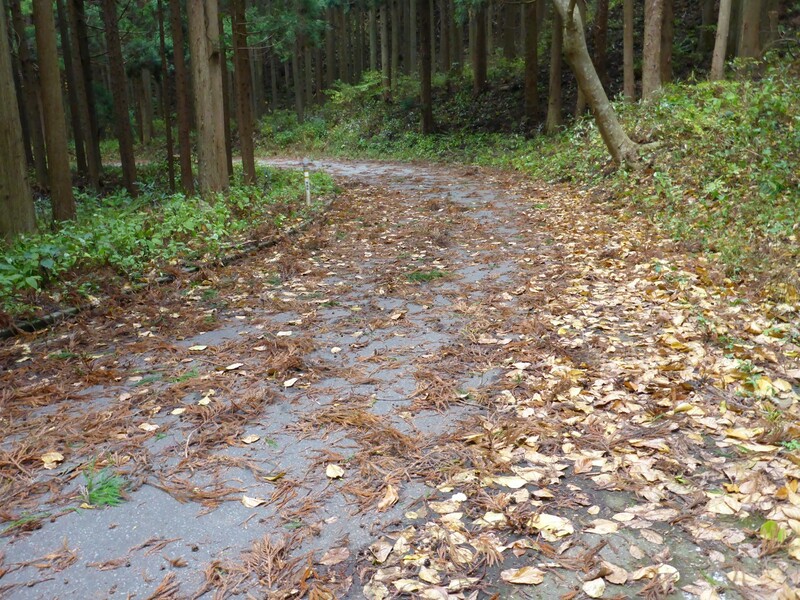 I’d ridden some of the routes that Osuma had pointed out to me, including one that went up and around Chokai Mountain. That was where I found the snow he’d been worried about but it was only at the top and was really only sleet. It’s cold in them thar hills! Tricky riding to get up there. Sae had introduced me to her friend Hiromi on Facebook and she got me booked into a Japanese style guesthouse in Ohata, run by a friend of hers. 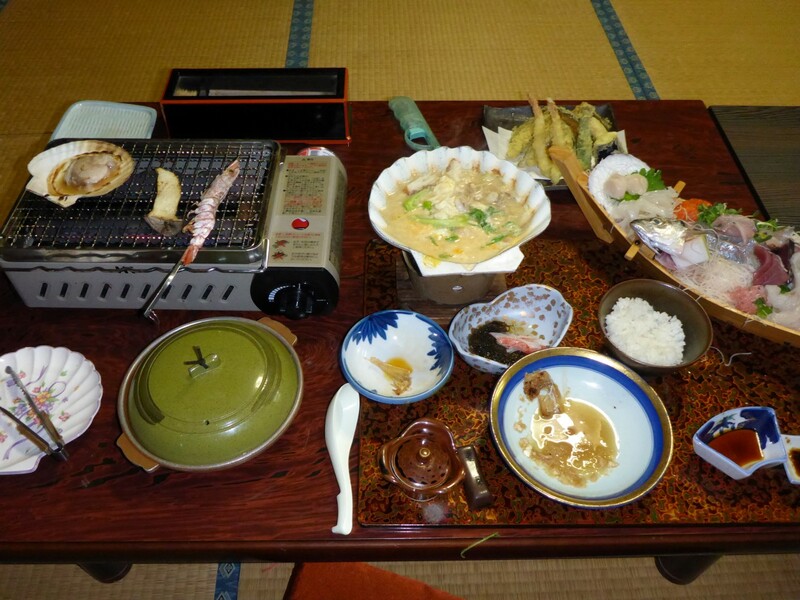 She also arranged for me to have a special Japanese gourmet fish dinner there. It sounded great. We arranged to meet near where she worked as it was en route. She’s a translator for a company that deals in nuclear materials and she told me her parents had invited me to stay on my way back south. Fantastic. Before that I was going further north to stay with another of Sae’s family friends, Yotoro Muraguchi. 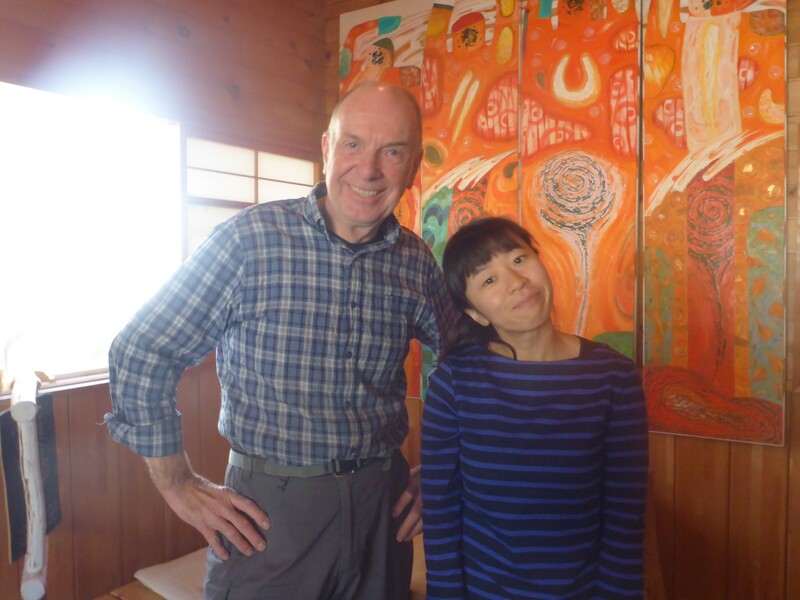 After sharing a coffee with Hiromi I headed up to Ohata and the guesthouse run by Ikuo and his wife. 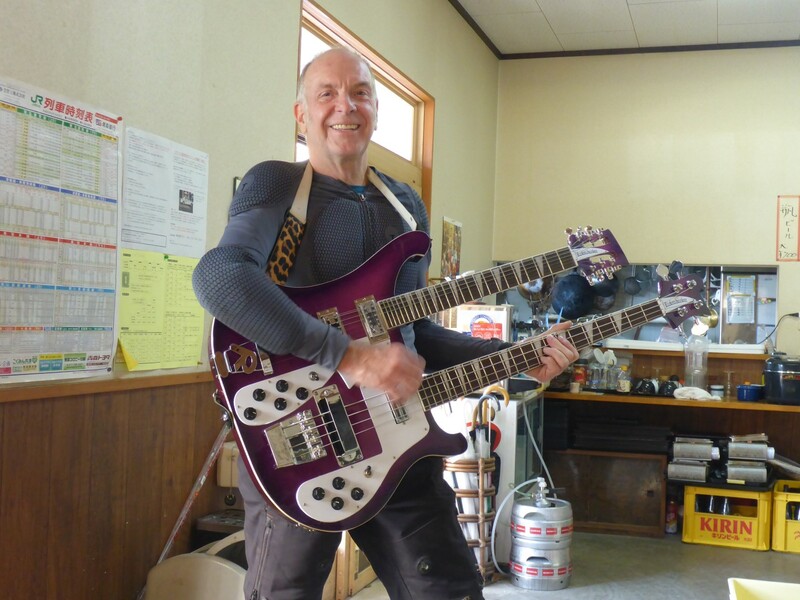 He’s a great guy, a professional musician who plays guitar, bass and drums. The setting for his guesthouse is wonderful, up in the hills, surrounded by woods and next to a river. 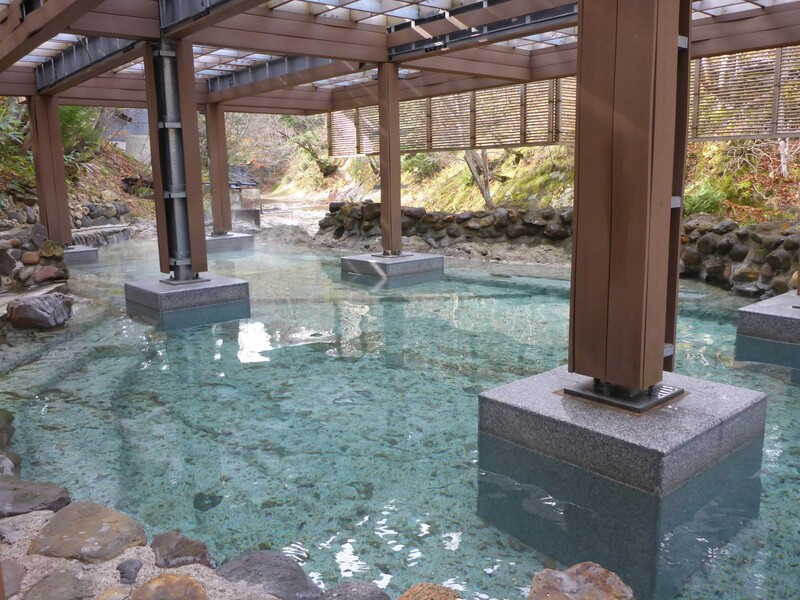 Northern Japan has plenty of hot springs and a favourite Japanese pastime is to visit an Onsen. These are places where you can bathe in the hot water. Most are commercial although some are free. There was one of each near to the guesthouse and I planned to visit one next morning. Outdoor Onsen. Sit and gently simmer. The meal I had was simply amazing. It consisted of several dishes but the main one was a basket of raw fish. This was eaten with soy sauce in which either ginger or horseradish had been mixed. Break off a piece of fish, dip it in the sauce and enjoy. It was delicious. A fishy list: Conger; Yellowtail; Oma Tuna; Squid; Scallop; Flat Fish; Mackerel; Salmon. The other dishes, whose names I forget, consisted of vegetables with a raw egg mixed in and a dish of beef, bacon and veg. Both were cooked at the table over a small gas fired grill. This was a real culinary adventure and was superb value too. People told me later that such a meal, served in a big city, would have cost a huge amount of money. Meal fit for a King, or Shogun. After a similarly exotic breakfast next morning Ikuo took me up to the public Onsen and left me there to enjoy getting boiled. I’d told him I would walk back through the woods. There were separate sessions for men and women, necessary because you don’t wear clothes in them. I’d arrived before the women’s session ended but as it was deserted I took a chance and got in anyway. There are no walls around the pool so it was a little bit chilly but the water was hot – about 40 degrees. I eased myself in and enjoyed a nice warm soak. I found that if I sat still so that the water wasn’t disturbed then the surface of it became too hot to touch. I believe the water comes out of the ground pretty much boiling hot and is mixed with cold river water to make it bearable. I think I lasted about forty minutes before I had to give in and get out. It was lovely! I always wanted to be a guitar man! A great guy (the one on the left, silly). 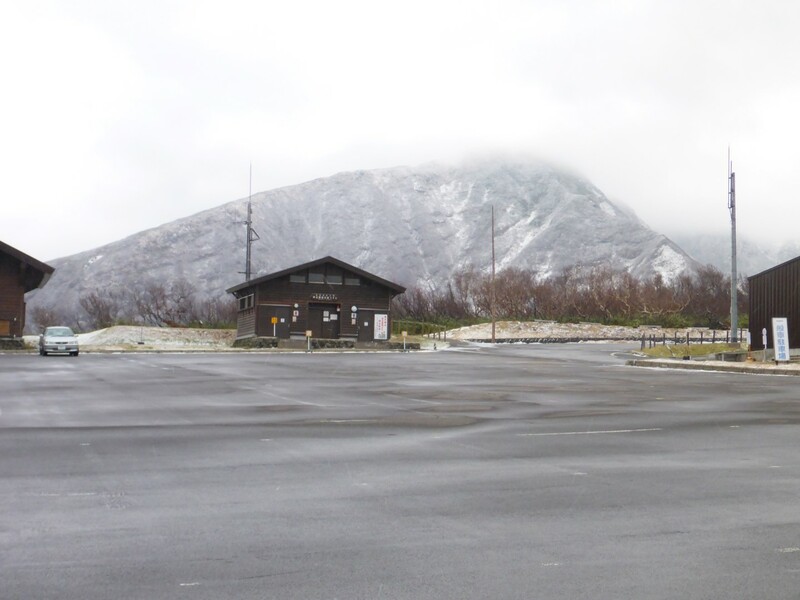 I left Ikuo and rode up to the North Cape, Honshu Island’s (and therefore the Japanese mainland’s) most northerly point. It’s near to Oma, from where it’s reckoned Japan’s best tuna comes. I’d eaten some of that last night! 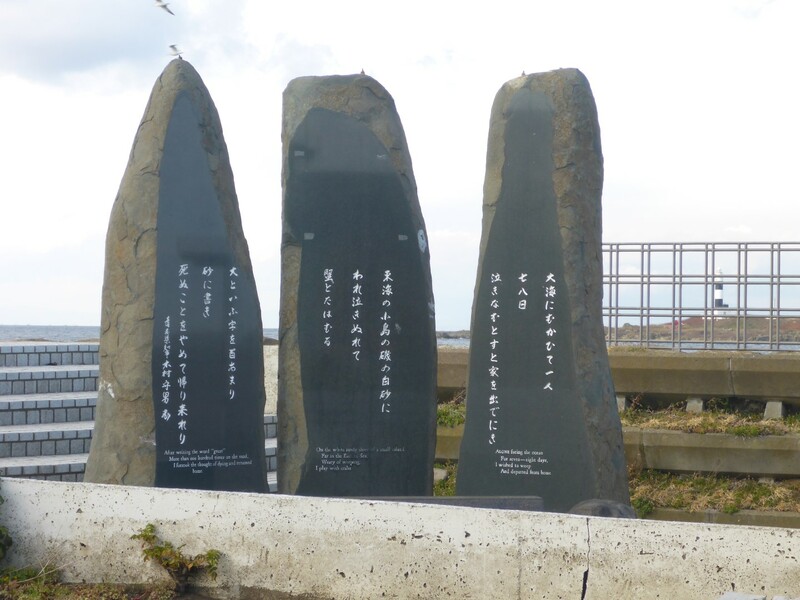 There are some nice sculptures up there, including three standing stones with poetry on them and a quirky one of a fist rising out of the waves with an Oma Tuna leaping towards it. 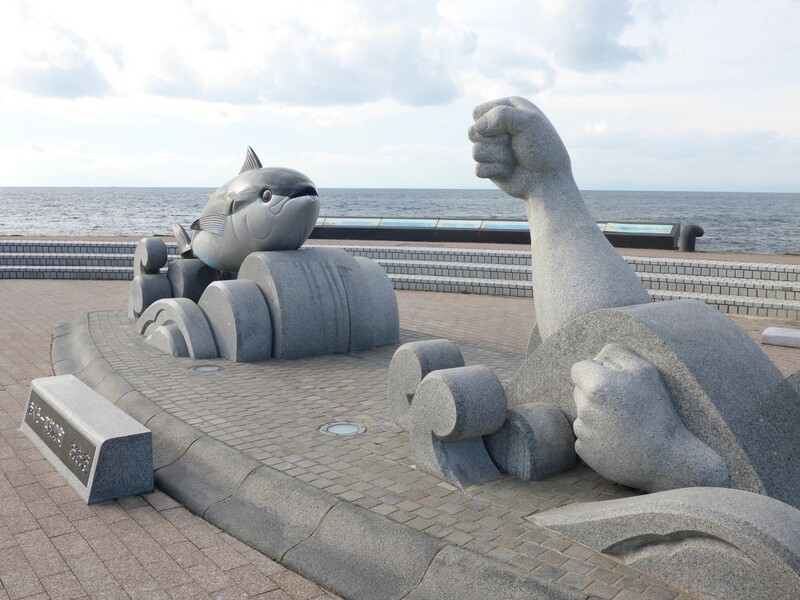 It’s supposed to represent the mastery of the Japanese fishermen’s success at tuna fishing. Very striking. I met a group of tourists there and offered to take their photo for them. They insisted I join them for a photo too. A few of them spoke English so we chatted for a while. It was one of those nice little moments that I love about travel. Always happy to meet with friendly strangers. I found Yotoro’s place with the help of a kind woman from the Village Office, who took me up to his house. In fact it was his business complex. There’s a factory where he produces various items from wood. Anything from a pair of chopsticks to large tables. There is a shop and cafe on site, with guest rooms above. People come to stay for weekends while they are taught the skills of wood working by Yotoro. He is very well known in the area for his work and his quirky character. His daughter, Kana, lives there too although she’s just married a Canadian of Bajan extraction so will be moving away soon. She was happy to show me around the place. 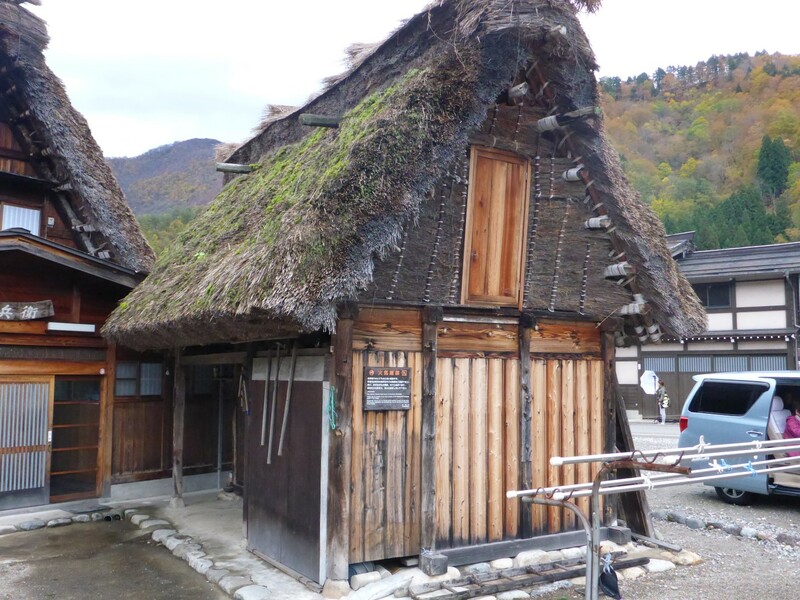 All his buildings were constructed with wood, as were most of the houses in the village. 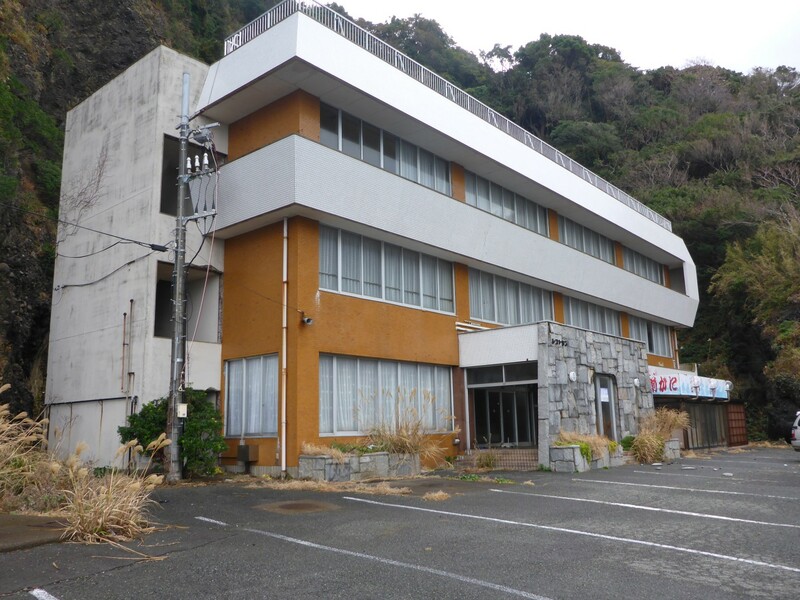 Quite normal for older houses in Japan and they’re good at surviving earthquakes too. At dinner, as well as the family, was Rachel, an American woman, who teaches English at the local schools. Her Japanese was fluent after two years in the country and we were all able to enjoy some lively conversation with her and Kana translating for me. I put myself in the frame for some gentle mickey taking by asking if I was using the chopsticks correctly but it seems I was doing OK. Kana had given me a pair with my name inscribed on them and I was giving them a try out. I had found that ease of use often depended on the size and material of the chopsticks. After a while my fingers were tended to refuse to obey my brain and it was as if I was eating with two lumps of wood rather than delicate tools. Nobody laughed too loudly though. 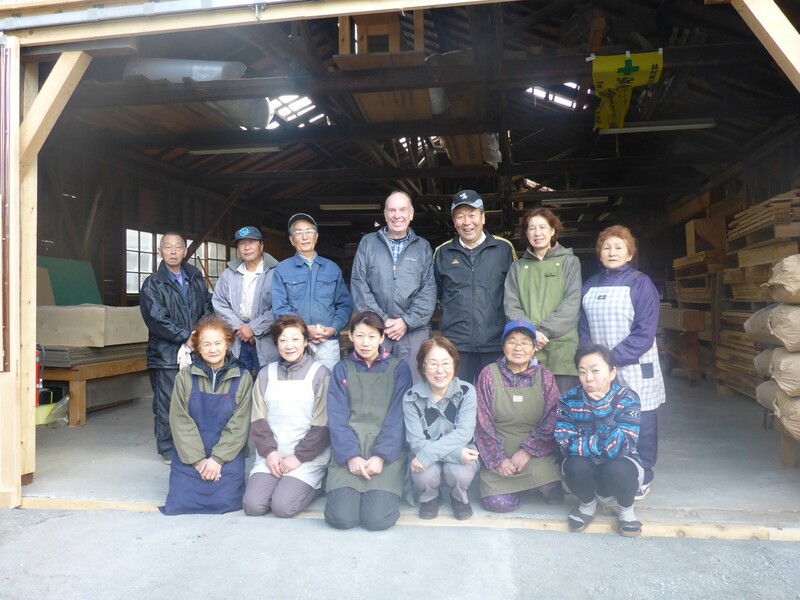 Yotoro-San (left of me) and his mostly elderly workforce. After that very pleasant stay I headed down to where Hiromi lives in Mutsu I had a nice run down the coast along some good biking roads. 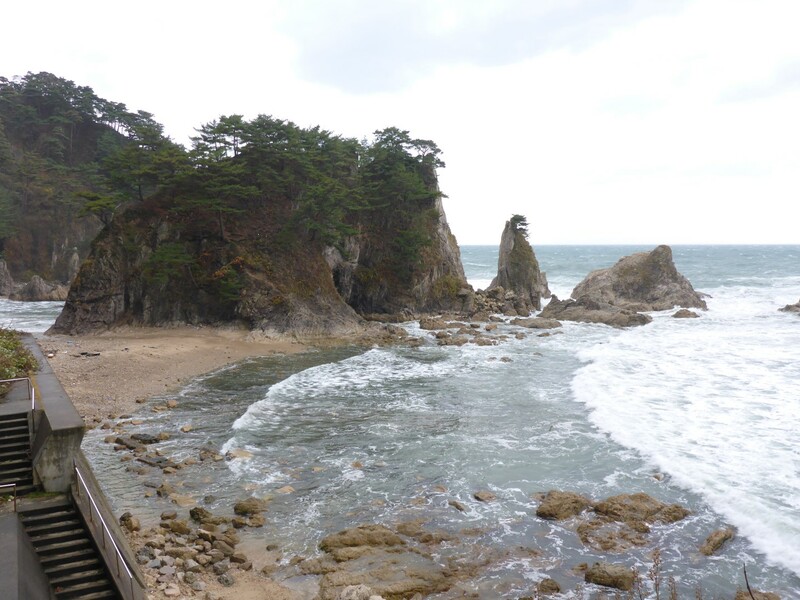 It was blustery and a bit cold but I was quickly warmed up when I stopped at Hotokegaura Cliffs and walked down to the beach. These cliffs are of a strange, green tinged limestone. They stand out at right angles from the main cliffs and have been worn into interesting shapes by the weather. Hotokegaura Cliffs, from a distance. The general countryside around this area is very steep and wooded, quite dramatic in fact. 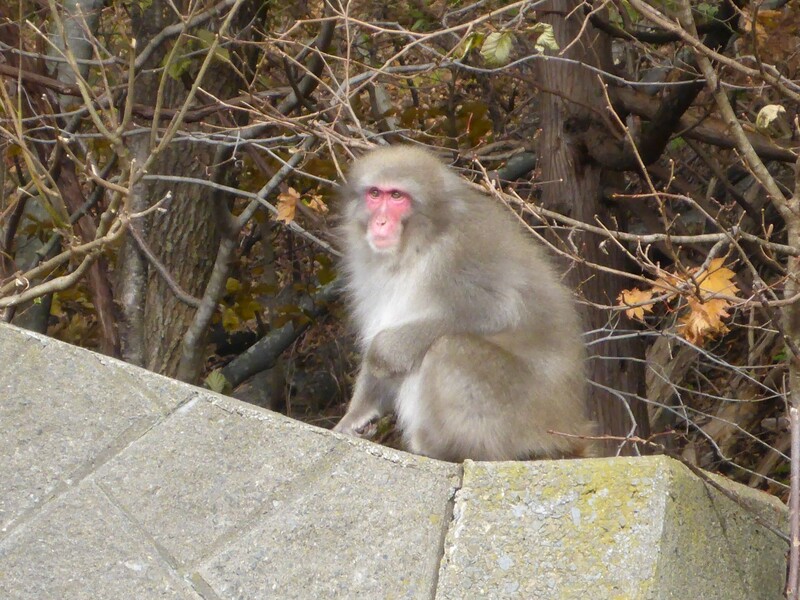 I even saw some monkeys at the side of the road. Being a peninsular means that the wind tends to blow across it too. 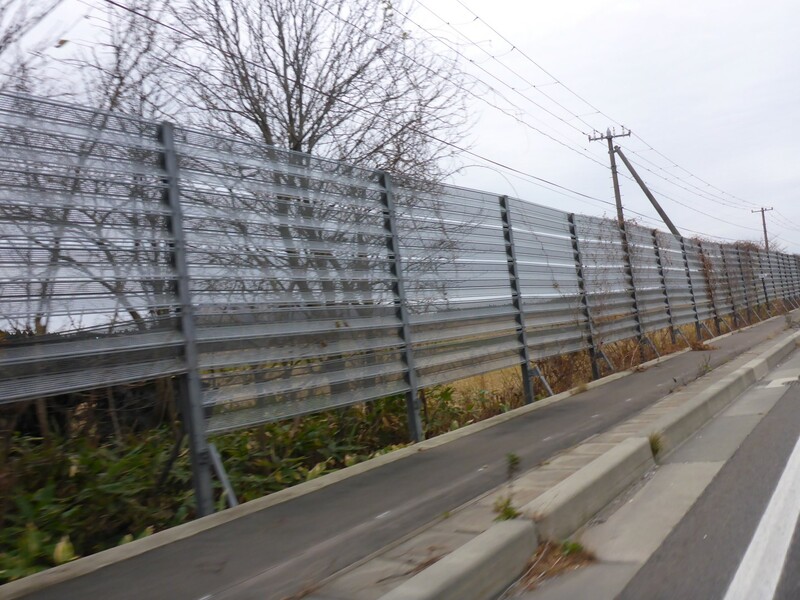 On some of the roads I had seen strange fences, with metal frames that had slats mounted across them horizontally. The slats could be turned so they presented a barrier to the wind and I worked out that their purpose is probably to reduce the amount of snow that gets deposited on the roads. They were electrically operated and therefore probably controlled remotely. A clever idea, I thought. A picture explains these better than words. Once I got to Mutsu I waited in town until Hiromi was able to meet me. 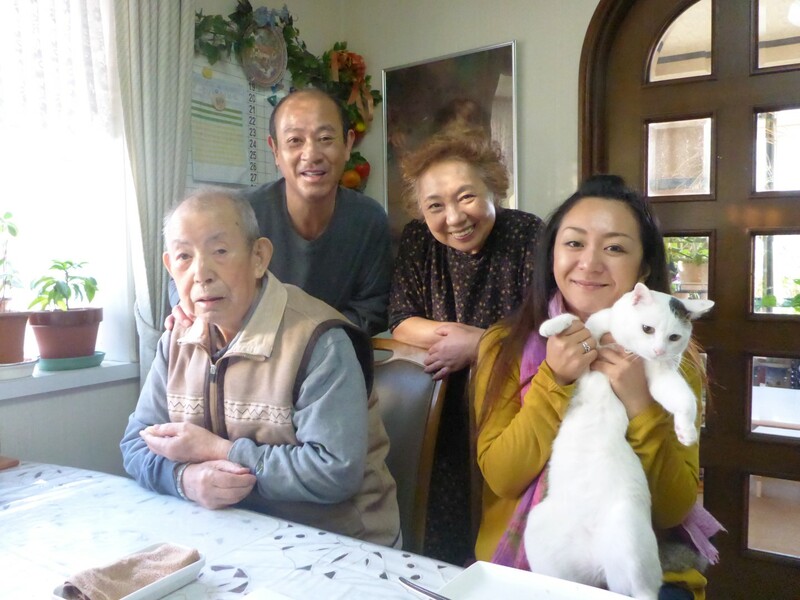 I followed her home and was introduced to her parents, Yoko-San and Kazuo-San. They made me to feel very welcome. Yoko spoke some English as she had a friend in England who had married an English man and she’d visited her a few times. But mostly Hiromi did the translating. I didn’t tend to see too much of Kazuo as he spent most of his time looking after his elderly father. Japanese meals tend to consist of several small dishes and I was able to give Yoko much pleasure as she watched my clumsy chopstick efforts. Every time I finished a dish she’d give me another one. Because she knew I was hungry? No, it was so she could continue to chuckle at my efforts to eat. I kept her laughing for days! Of course, there was no malice there and we had a good laugh together. I was getting better though. 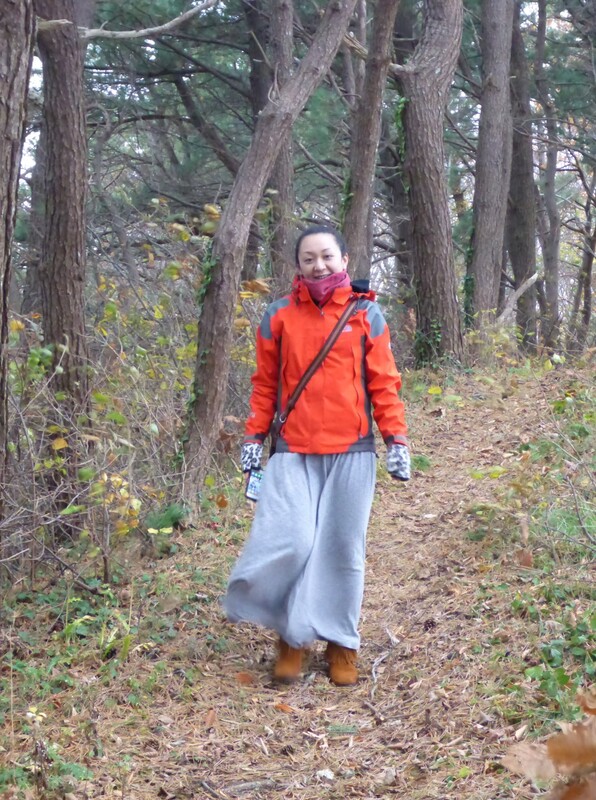 I had a great weekend with Hiromi. On Saturday she went with her Indian work colleague’s pregnant wife to her maternity appointment. 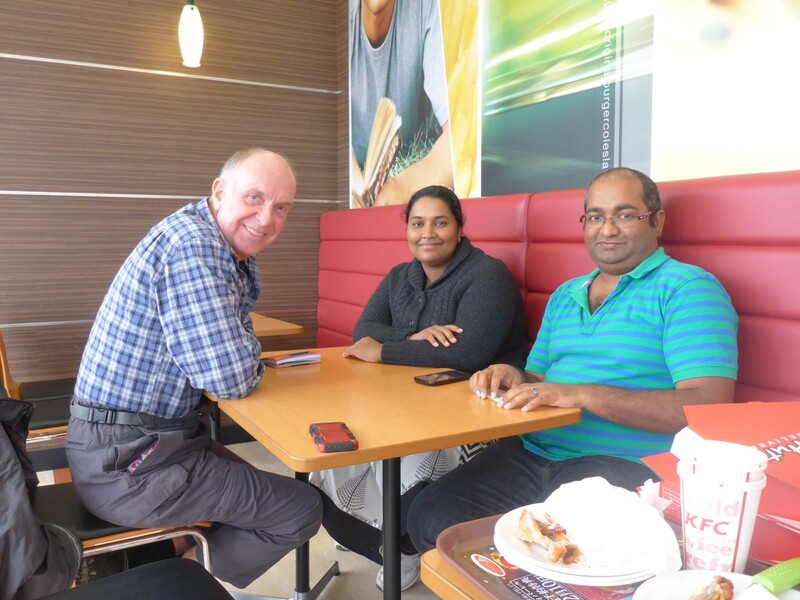 I met them afterwards and took the opportunity to find out a bit about the Indian custom of arranged marriages. I asked them how they felt about having their family choose their partner for them. They’re both very happy about it and like the custom. Harish told me their families are distant relations. His is from the north and Playa’s is from the south. They now have a home in Chennai although they’re working in Japan at the moment. They are both highly educated. Playa said that because the families were so involved it made her feel very safe and protected. She knows they will always get support from them when they need it. They both felt that marrying for love is a very strange idea and such a marriage is more likely to fail than an arranged one. They met for the first time just before their wedding and then spent a long time getting to know each other. That was a very interesting conversation. They’re certainly one of the happiest and relaxed couples I’ve seen. They both ride bikes and said they thought I was some kind of great adventurer because of the journey I’m on. I was quick to disabuse them of that notion, saying it was just a long holiday. Anyway, I’ve got an invite to call in when I eventually get to Chennai. 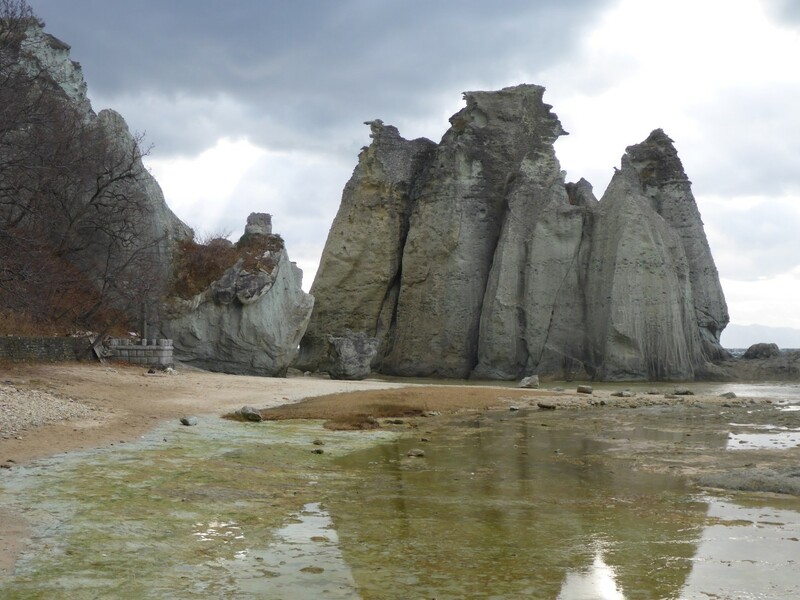 On Sunday we took a drive out to the Natsodomari Peninsular. This is a place Hiromi likes to come to when she wants some peace and quiet. It’s wooded and remote. We stopped off at Tsubaki Shrine where I watched her go through the clapping and bowing ritual. She explained to me how it’s done. It felt very odd to me when I tried it but it seems to come naturally to all Japanese and I know it’s done with genuine spiritual feeling. 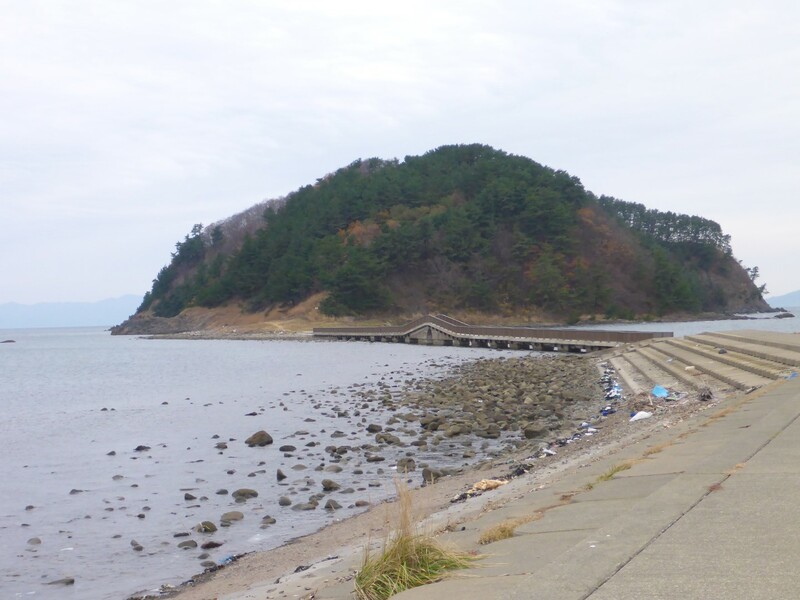 We went to visit Oshima Island, taking a walk out along the causeway and a climb up the steep hill for a nice view across the bay. Afterwards we went into a cafe. Inside were a couple of tanks, one with fish swimming around and another with squid in it. 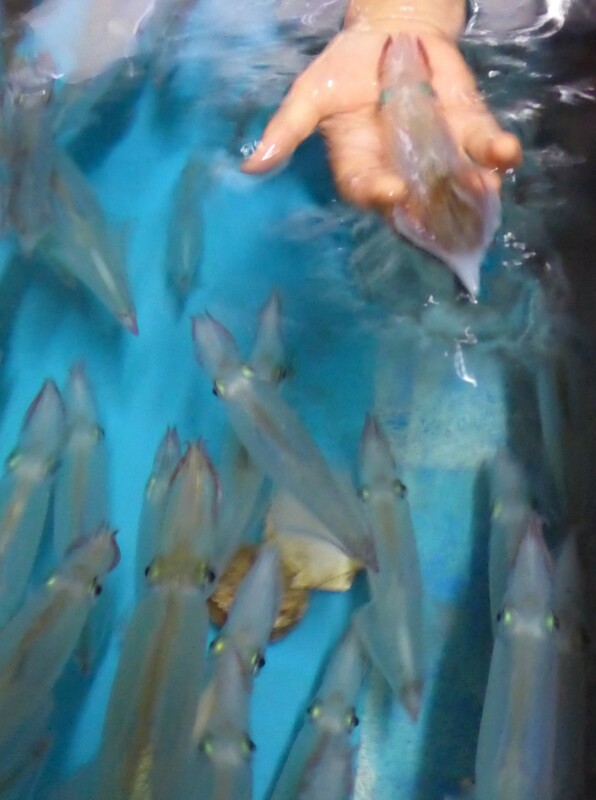 Hiromi ordered some squid to take home and the woman took them out with a net then proceeded to peel the skins off them while they were still alive, as far as I could see. She gave each of us a skin to eat and they were rubbery but tasted quite sweet. Hiromi then ate a head, eyes and all. I passed on that one! After something to eat back at home we went to an Onsen, one with full facilities this time, including a shower area that you use before you go in. I made a bit of an idiot of myself by mistakenly using another guy’s personal wash kit instead of the one supplied. When I realised what I’d done HE apologised to ME! I felt very bad but a soak in the hot pools made me feel better. One of them had some kind of electromagnetic pulse system where the force seemed to grab hold of the insides of my body. The closer I got to the grid, the stronger the force. It felt very odd. My final day was spent washing Doris and sorting my gear out. It was clear that my chain was at the end of its life but I cleaned and lubed it as best I could, hoping it would last until I got to NZ. 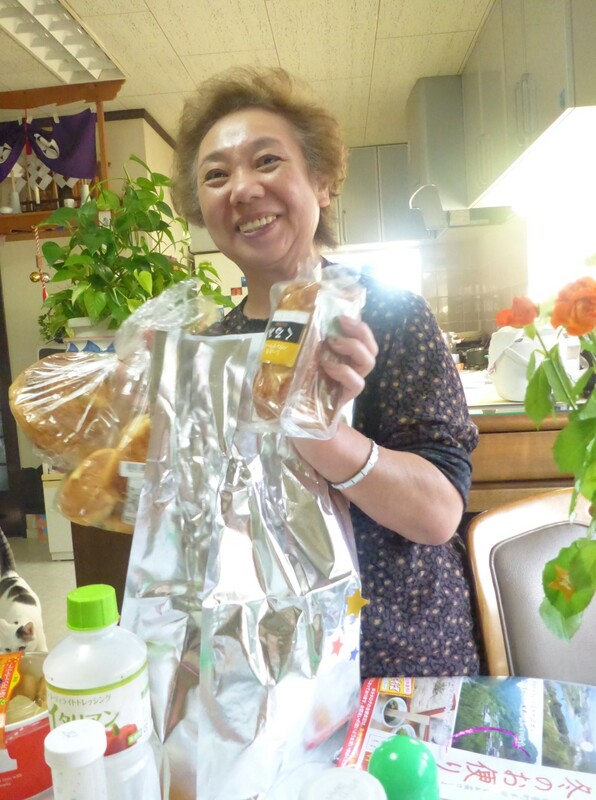 When Hiromi came in from work she took me to a local store where I was able to buy some flowers and cakes for Yoko. With Hiromi’s help we wrapped them up in a gift bag. It wasn’t much but I was very grateful for the way she’d looked after me. When I gave them to her next morning at breakfast she seemed genuinely delighted so I was very pleased too. Yoko-San seems to like her gifts. I’d had a great time up on the northern peninsular and had met some fantastic people. 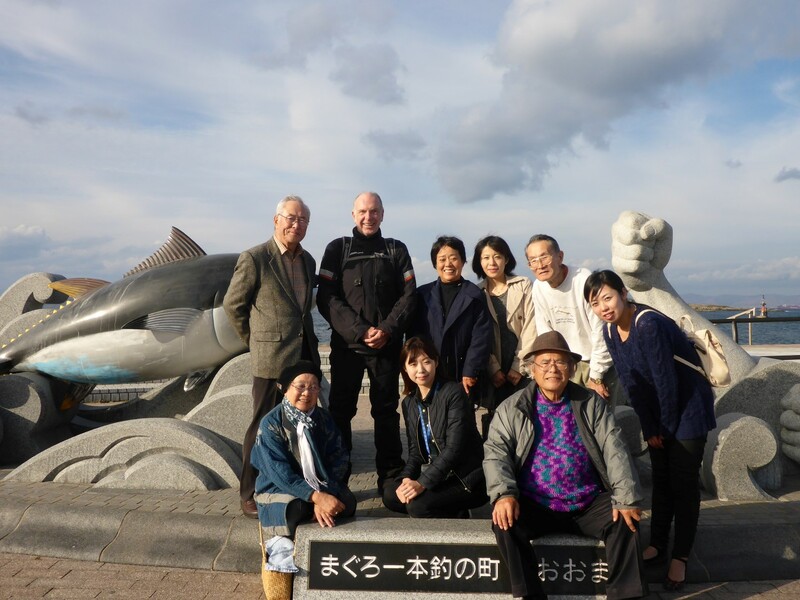 I was honoured to have been received with such hospitality and kindness and pleased to have learned yet more about the Japanese way of life. I’d spent a few days on my own, either sleeping out or in hotels, so it had been great to have some company. I’d reached the conclusion that the Japanese are lovely people. Time to head south again though, and hopefully some warmer weather. 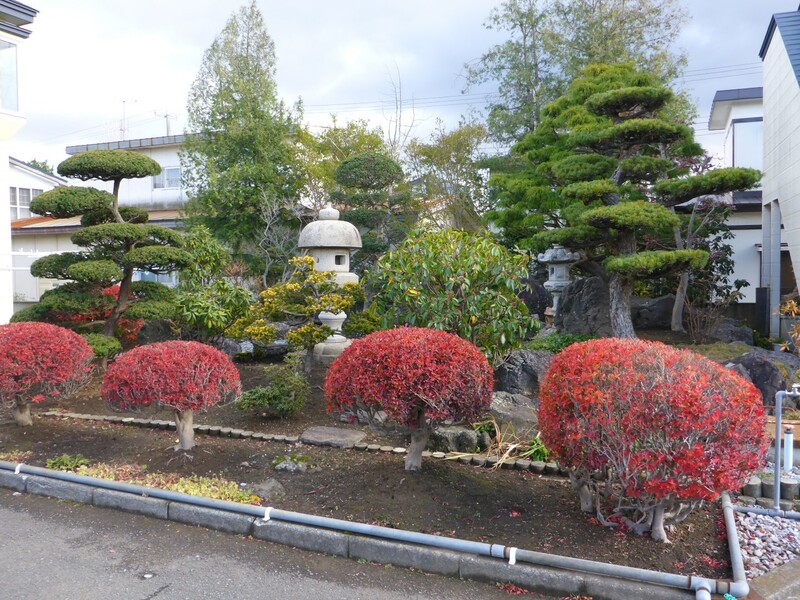 The Japanese definitely know how to create a lovely garden. Hi Dave. Yes, the heli-hike finally happened and that was a truly incredible experience. Being ina chopper is like nothing else I’ve ever done, flying wise. Lift off and go. No fuss. The glacier was truly awasome too.